Why Doesn't My Guinea Pig Come Out of Its Box? Some first-time guinea pig owners find themselves disappointed by how apprehensive their new pets seem to be. A cavy in a new setting may spend most of his time hiding in whatever shelter he can find in the cage, only venturing out for food and running at the first sign of movement. Helping your guinea pig acclimatize to his new surroundings will help him accept his new home and make him feel comfortable and confident enough to venture out into the world. The most important thing you can do to help your guinea pig relax is to let him settle in on his own terms. For the first few days, avoid trying to handle him. Give him time to explore his new surroundings and come to think of this new place as home. Feel free to talk to him to get him used to your voice, and make him aware of your presence when you provide fresh water, pellets, hay and vegetables. Keeping his first days calm and avoiding unnecessary agitation will make an enormous difference in how quickly he adapts. 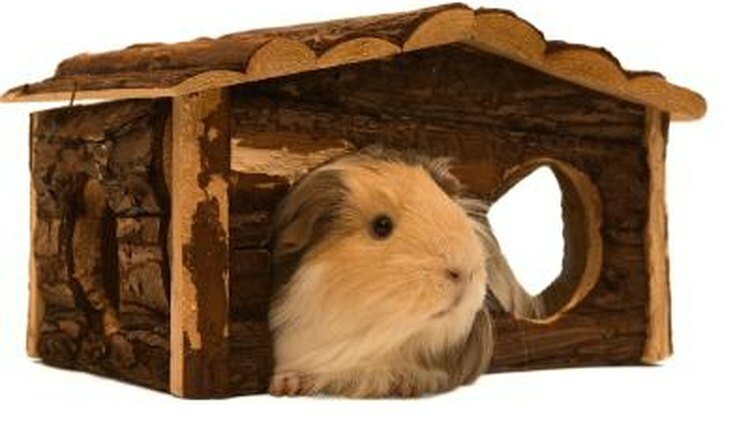 Keep your guinea pig cage in an area of your home that promotes a feeling of calm and quiet. If your cage is in the same room as the home entertainment center, or an area frequented by small children or other pets, your guinea pig may have a harder time adjusting to the new environment and may spend more time hiding from these noises. While you should keep your cage in an area with some traffic to provide the cavy with attention and get him used to mild levels of activity, keeping things as quiet as possible for the first few days will help him come out of his shell. Ultimately, how readily your guinea pig adapts to his new home depends on his personality. Your cavy may be naturally inquisitive and curious, and may come out to explore his new surroundings as soon as he feels safe. On the other hand, he might be cautious and timid, and spend most of his time peeking out from safe hiding places even after he has come to accept you as a friend. The best way to convince a guinea pig you mean him no harm is to associate yourself with food. At first, you can simply place vegetables and other treats in the cage and let him retrieve them at will, but after he becomes more comfortable with your home, you can use them to lure him out of his hiding place. Hold a leaf of romaine lettuce in your hand, keeping it still, and see if he will brave human contact to get at the tasty treat. As he becomes more comfortable with you, you can work your way down to smaller items like spring mix leaves or baby carrots to encourage him to come closer. Over time, you should be able to draw out the most introverted guinea pig with a tasty enough bribe.